Branch Meeting, 13 December, 2014. 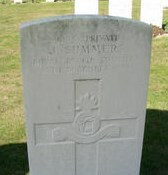 Killed in Action, 13 December, 1914. 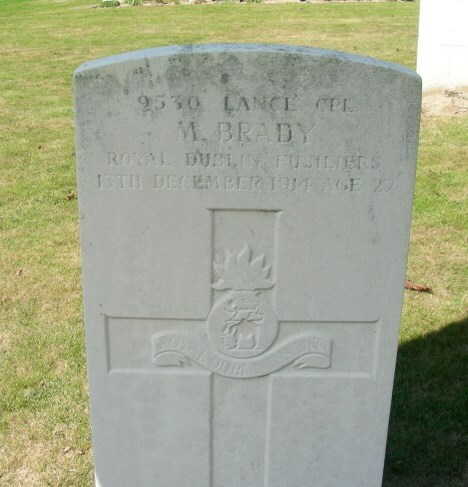 We know very little about John and Michael, ‘Soldiers Died in the Great War’ tells us that they were both born in Dublin, and that John also enlisted there, Michael however, had moved to Kildare and enlisted in Maryborough. From the CWGC ‘Debt of Honour’ we know that John had a married sister, Mrs. M. J. Booshell of 4 Lower Dominick Street, Dublin, and that Michael was the son of Michael and Mary Brady and the husband of Elizabeth Brady, all of Ticknevin, Carbury, Co. Kildare. When war was declared, 2 Royal Dublin Fusiliers were based at Gravesend, Kent, and were held back for fear of a German invasion, however, as the situation on the Continent worsened, the battalion, part of the 4 Infantry Division was sent over while the BEF was retreating from Mons. 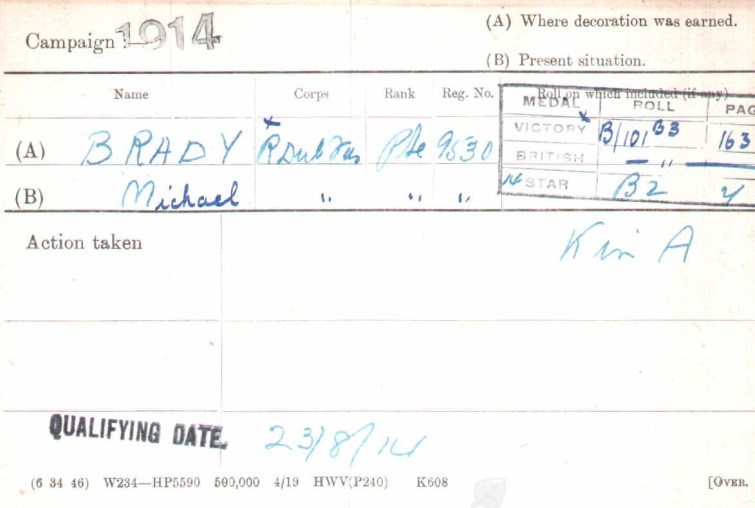 We do not know if John and Michael were regulars or reservists at the outbreak of war, but what we do know is that when the orders to proceed to the Continent were received both men were with the battalion, and as shown on their Medal Index Cards (MIC), they landed on 23 August, 1914. The battalion saw their first action a few days later at the Battle of Le Cateau and over the coming months were engaged in a number of major actions including the battles of the Marne, the Aisne and Armentieres. 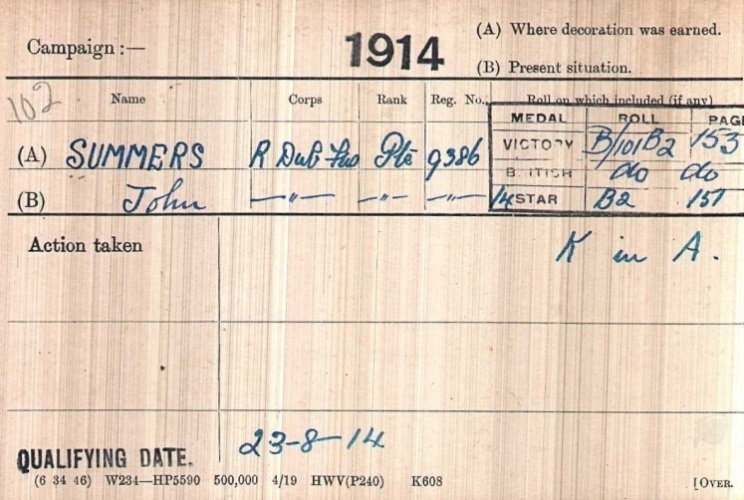 The battalions War diary for the 13 December, 1914, tells us that they were in the trenches at St. Yves where they were being shelled and sniped at, three men were injured and two, John Summers and Michael Brady were killed. They lay side by side in graves I. B. 1 & I. B. 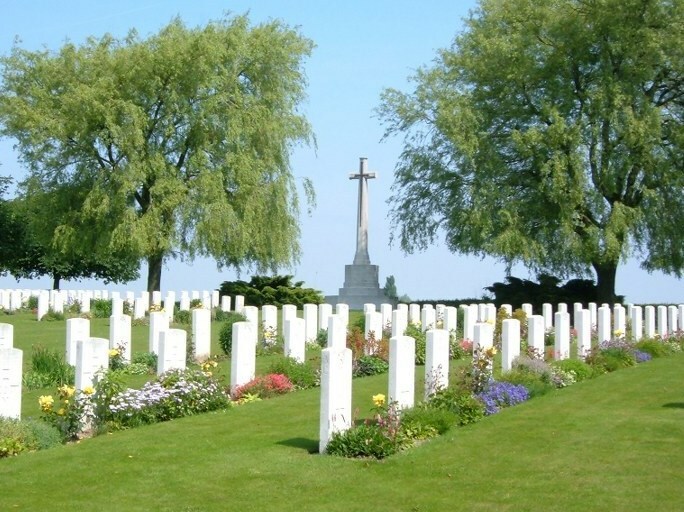 2 in Prowse Point Military Cemetery, which is about 5 miles south of Ypres.